This week Jean-Paul Gaultier had the honor of designing this Sundays “Welt am Sonntag” newspaper here in Germany. 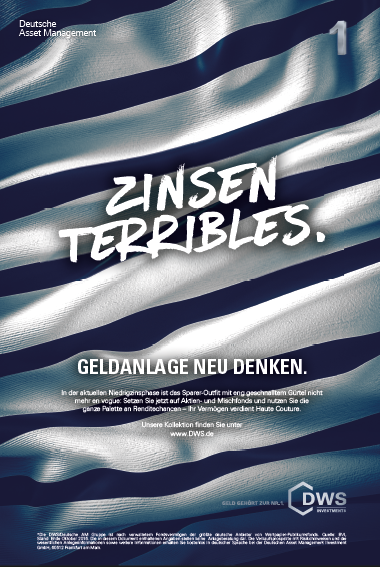 We therefore took the opportunity to run an ad based on the famous deisgner, this time with our great agency #bourros based in Frankfurt. They came up with a great idea. “Zinsen terribles” (interest rates terrible) is the headline. The copy is written like fashion ad – your savings account is so not en vogue. And your portfolio deserves only haute couture.